Don’t hit a hornets nest with a short stick. This is good advice for anyone. I’ve never poked at a hornets nest before but I’ve seen what happens when you do. One of my good friends growing up did this and the results weren’t pleasant. Meaning: Don’t take unnecessary risks that could blow up in your face. A hornet’s nest certainly qualifies as something that can blow up in your face. Another way to look at it is you should never slap a man chewing tobacco. Self explanatory. If you lie down with dogs, you get up with fleas. In most other places but the South, people would probably associate this with an ad for avoiding a sexually transmitted disease (and it would make an effective one too). Meaning: Be careful about the company you keep. To a Southerner, one’s reputation is as good as gold. If you hang out with bad company, you will find yourself the victim of what they call “guilt by association”. This isn’t easy for a teenager to understand sometimes but I get it now. Some of the people I thought were “cool” when I was a teenager ended learning the fine art of pressing license plates for 25 cents a day. I would a whole lot rather buy one for a few hundred dollars every year on my birthday. One day you’re drinking wine; the next day you’re picking grapes. I have my own interpretation of this one that is different from the generally accepted one, taking it to mean that the things you enjoy today will come at a price tomorrow. The family recipe barbecue sauce that I enjoy on my sandwich today will have to be replaced tomorrow with a lot of hard work to make new sauce. The good news is that there will be sauce for the next day. Regarding grapes, I never actually realized that I’d ever picked grapes until I found out that muscadines really are grapes (then I wished I had a dollar for every one I pulled from my grandfather’s vines that he grew in his large backyard). My grandmother made muscadine wine seasonally when I was growing up and would let me try it occasionally. I never realized how much total work was involved in the process but since it takes about 2.75 lbs of grapes to make one bottle of wine, I suppose I deprived them of a few bottles over the years by eating their muscadines. They never seemed to mind though. Real Meaning: Even when things are going great, circumstances can change quickly so don’t ever get too comfortable with the current state of affairs. Even an ugly tree gives shade. When we bought our house a little over ten years ago, our yard had mostly small sapling trees that had been planted by the landscaper with one notable exception; a rather large sweetgum tree that had been there before the building lot was prepared and left there by the builder. I was just excited to have one mature tree (Southerner’s have a thing about trees) until my grandmother, always the arboreal expert, came over to the see the house and told me I needed to get that sweetgum tree cut down. She said that they were a nuisance and that they would disgorge thousands of prickly burrs each year-in essence, they were just a sorry tree. I didn’t want to cut the tree down though because it was our first new house and it was our only mature tree so on this one rare occasion I went against her advice. Every year, for ten of those now, the sweetgum tree sheds a bumper crop of prickly burrs, a half-dozen limbs and enough leaves to cover Rhode Island but every spring, it grows countless bright green leaves and every fall they turn a brilliant shade of gold. Best of all, it’s the largest tree in the neighborhood and it shades an entire section of the front yard. I appreciate this all summer long when I am mowing the lawn in the scorching Georgia sun because each time I make a pass around the house, it provides me with a short break from the heat and makes a nice place to stop mowing for a minute to cool down some. Meaning: God has a purpose for everything and there is something of value in everything He creates. Even a sweetgum tree. Is that really the hill you want to be crucified on? It is easy to jump on a bandwagon, follow a cause or get behind a movement when you find something appealing about it or when others get you stirred up about it-sometimes to your own detriment. Several years ago I came up with an idea for a bill to be introduced in the state legislature that would give a member of my profession a seat at the table on the state council that regulated it and other related professions. It seemed only fair that all of the regulated functions should have equal representation on the council and my legislator was happy to sponsor a bill to that effect. This was an important lesson in politics and power for me. It seemed the other entities who did have representation took exception to this and they also had lobbyists in their association to help persuade the legislators to see things that way. Needless to say, the bill was sent to a committee to die in and it never saw the light of day again. The good news is that a lot of people on the state level knew who I was after that and I was able to help push other things through later. Meaning: Choose your battles wisely and make sure that the one you choose is the one you’re willing to give everything you’ve got, even if you know you might crash and burn trying. Gifts with handles on them can only lead to work. The meaning to this one is pretty self-explanatory. In twelve years of marriage, my wife has given me a weed eater, a leaf blower and a grill. With the weed eater I spent most of its life cursing it. The leaf blower actually comes in handy for a lot of things, including a fast way to dry the car off after washing it without scratching the paint or leaving spots. As for the grill, all good Southern men love to grille but we act like its hard work to do it. I actually like the handle on the grill because I would get burned trying to open the lid without it. In her defense, she’s also given me a lot of other gifts that don’t have handles so I’m not complaining and she puts up with a lot of crap from me (yes, I used the word crap because nothing else sums it up so well) which is one of the reasons she got a new handbag that she liked the other day. It happens to have handles on it. Lesson: It isn’t the reason for the gift, or what the gift is itself, but the act of giving. Christ was a gift from God but even He didn’t come without doling out assignments. Great Balls of Fire. Every Southerner needs an expression they can use when there just isn’t any better way to sum up frustration, anger or shocked disbelief. This expression was around long before Jerry Lee Lewis made it famous in his song. Scarlett O’Hara used it quite frequently in “Gone with the Wind” and I used to hear it from time to time when I was younger uttered by members of a generation now “Gone” as well. This Southern expression, according to Wikipedia, is considered to be blasphemous by some Christians and refers to the defining moment of Pentecost when the Holy Spirit manifested itself as “cloven tongues of fire” and the Apostles spoke in tongues. My mother likes to say “Great day in the morning!” as an expression of disbelief or of anger (a slight modification of the tonal qualities can shift the entire meaning and intended purpose of this and other phrases). Her father used to say “Good God Almighty” (which, when properly used by a Southerner, is pronounced “Good Godamighty”). I use this one quite a bit myself when I get angry about something or modify the tone somewhat to express disbelief. When all else fails and anger is about to rain down one someone, I pull out the big gun with “Great Balls of Fire!” and let things fall where they may. Southerners have a great need to express themselves but our honorable upbringing prevents us from saying what is truly being thought because of the irreparable damage that poorly chosen words in a moment of anger can cause. It’s a whole lot more efficient and less costly to say “Great Balls of Fire” than it is to say “that is the stupidest thing you have ever said and if dumb were dirt, you’d be an acre”. Most of the time the reason for getting that mad isn’t worth the hurt you can cause someone by saying all that. Lesson: Choose your words wisely and when all else fails, a great expression with just the right tone can speak volumes. Things that Southerners say is a study of regional history and homespun wisdom and I have only scratched the surface with these few I have listed here. While some may thing we speak from illiteracy or the backwards dialect of “country folks”, I am reminded of what the Poet Laureate Maya Angelou once said: “Listen carefully to what country people call mother wit. In those homely sayings are couched the collective wisdom of generations”. Well said Ms. Angelou. Great article. 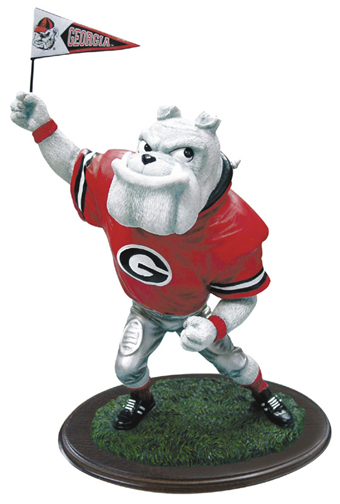 Yes, go DAWGS! Loved your article!!! My favorite tree in the world is the gum-ball tree. If you pick a leaf (which are lovely to look at), crinkle it up and smell it, the scent is divine. And the leaves are so brilliant green in Spring. Growing up, we too had an old gum-ball tree in our front yard but it became sick and we had to cut it down; I was very sad to see it go and, like a good Southerner, I still remember that tree fondly. As a child, I went barefoot (at home) and walked on the gumballs without second thought although I don’t think I could do that now. Thank you! The tree just keeps getting bigger and putting out more “gum balls” but we just keep enjoying the shade and try not to ever walk barefoot near it. I appreciate your comments!